The head of the United Nations agency charged with defending the freedom of the press today condemned last week’s killing of a Canadian journalist and kidnapping of two French television reporters in Afghanistan. 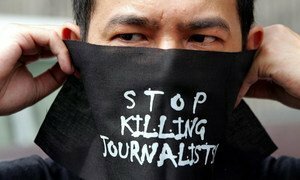 “Violence against journalists constitutes an attack on the fundamental human right of freedom of expression; it is therefore a direct threat to democracy,” said UN Educational, Scientific and Cultural Organization (UNESCO) Director-General Irina Bokova. Calgary Herald journalist Michelle Lang, 34, was killed in a bomb blast on 30 December while traveling with four Canadian soldiers in the volatile Kandahar province after spending less than three weeks in Afghanistan. A reporter and cameraman for France 3 television were taken hostage by gunmen on the road near Omarkhil, north-east of the capital, Kabul, on 29 December while working on the current affairs programme “Pièces à conviction,” and there has been no word from them since. “The fates of these three media professionals cruelly underline the dangers that journalists face when they go into areas of conflict to provide news coverage,” said Ms. Bokova in a statement condemning the killing and abduction. Broadcasters attending the United Nations-backed fourth World Electronic Media Forum (WEMF 4) have called for sustained and concrete global action to address the murder of journalists in peacetime and in war.